Prepare to accept history's greatest challenge: build the world's most powerful empire over a 6,300 year time span, reaching from primitive history to the future realms of science fiction. It's your time to rule! Call to Power II is the sequel to Activision's problematic Civilization: Call to Power of a year and a half ago. In many ways it's the spiritual successor to the famous and beloved Civilization and Civilization II from MicroProse. The good news is that Call to Power II is streamlined, improved, and overall a much better game than its immediate predecessor. But it still doesn't hold a candle to the original Civ classics. Call to Power II is turn based and challenges players to begin a tiny civilization in 4000 B.C. You take your empire through the millennia to approximately A.D. 2300, passing through all sorts of social and technological eras and guiding your civilization into a vast world empire. 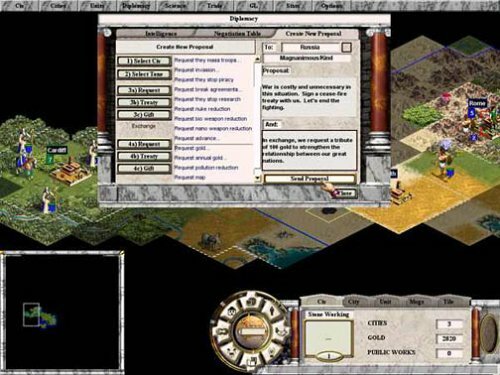 The game lets you manage technology, diplomacy, trade, and warfare through well-laid-out screens and information bars. Everything is easy to read and follow once you get the hang of the very complex interface. But the complexity yields tremendous depth, making it all worthwhile. I bought Civ3 and went back to CTP2! Yes, this game is quite old now, however, I dig it out and play it every 3 months or so. I have also been able to get several friends into it... even recently! They didn't mind that the graphics look a bit out-dated, especially compared to the ("fisher-price" looking) Civilization 3. I have played Civilization 3, and was severely disappointed that it was not multiplayer (CTP2 has always been multiplayer). The first expansion pack to Civ3; "Play the World" made the game multiplayer... and added some interesting variations (like not having to wait for other players to finish - something that was not implemented into CTP2). But at the end of the day, we did not enjoy it as much as a good old multiplayer game of Call to Power 2! Also CTP2 you can eventually build under the sea, Civ3 can't! The technology in CTP2 is far more evil than the tame Civ3... it feels that CTP2 covers 3x more technology than Civ3. Also, armies can be configured to attack as one group, in Civ3 everything has to attack separately... This is only a taste of what is missing in Civ3, compared to abundantly featured CTP2! Why play the latest game, if it is far less fun than the previous version? Beware: In multiplayer; Once every 1-4 games or after about 20 hours of play, the game crashes, and you may have a challenge getting back the multiplayer (auto-save) game... really annoying after 15 hours of constant play to have to start it over, totally from scratch again! So _manually_ save often! i bought this game hoping for a really improved civ2 type of game.I have to be honest the AI of your passive computer opponents is absolutely horrible.Once you fortify your cites the computer opponents just lay back and wait for you to attack and that's it. The diplomacy in the game has many options but they usually have the same pat answers for everything. activision has promised some text to come out on how to tweak the ai but no mention of a patch for this. can't recommend this game. try alpha centauri instead. Finally Activision has made the needed changes to the original Call to Power. The original game created huge expectations but failed to deliver on a lot of levels. Even if this new version does not revolutionize the concepts of the classic Civilization series games, at least it addresses the many deficiencies of the CTP 1. There are some new features, but these offer only a small improvement. Diplomacy is the most notable new feature, with the ability to trade proposals and counter proposals with other players. However, the vast majority of my carefully constructed offers met a frustrating blank wall of unexplained rejections. The original's easy to use interface has been upgraded to give greater depth and content, it takes a bit of learning but it's effort repaid. Gone are most of the city management features in the pursuit of a true empire-building concept. Mayors can be employed to manage all the mundane decisions using the same approach as computer players. Unfortunately the AI has not improved greatly, the computer will struggle to give a medium skilled human player a run for their money. The real good news, I think, is that it looks like this effort is more open to player customisation than the first attempt, which had to rely heavily on customer mods to reach the level of playability. CTP (call to power) will give you a long game filled with many many choices. I will compare CTP with CIVIII. These games are very similar. They are almost exactly the same in how a city is managed. Each city has the 20 nearest squares from which to draw resources for its livelyhood. Buildings and units are built based on the amount of production harvested and the types of factories and power-plants used. Like CIVIII units in CTP wonder around a grided map and encounter each other on the terrian of the defending unit. Like CIVIII there are resources and techknodgies that enable the building of units, buildings, tile imporvements, wonders, and other stuff. In CTP there are more tile imporvements. There are three types of food boosting improvements each more expensive and higher tech than the last. Ther are also 3 types of production boasting improving imporvements. The method of imporving terrian in CTP is vastly superior in realism and ease. An infrastructure "tax rate" is set for the entire nation, from which production is siphened for the purpose of imporving the land. The tax is utilized when you select a tile to be improved. Thus the whole thing with dozens of "workers" having to be managed and moved is illiminated. The CTP combat is also superior to CIVIII. In CTP units do not simply go head to head, instead attacking units combin into a two layered force that has the effect of giving an advantage to the larger force. The first layer utilizes their attack/defense power against the opponent's attack/defense while the second layer exchanges ranged power attacks. Thus some types of armies are better than others. I found for instance that a efficient middle age force could be made of (x) pikeman (x/2, round up) musketeers and (x/2, round down) cannons. This force could defeat more expensive forces because it takes advantage of the cheapness of pikman while utilizing the ranged attack of musketeers and then of cannons. The chosen governemnt of your civilization has a much more profound effect, especily when combined with the ability to adjuest the wages, workday, and rations. The combination of these effects can cause your nation to focuse on growth, techknolodgy, production, war fighting or some combination of each. Ectopia for example is not great for production or growth but is great for science and war, combined with this you can adjust the food/wage/workday settings to stress growth, thech, or production further. My advise is to make sure that you are growing but also to maximise production above all other things. In CTP you can garner many cities, i usualy acrue over 80 and often so many that i must abandon some. At about 110 cities you must abandon some our else be punished by a stupid feature of the game. But it is a mixed curse, managing 100 cities can make each turn take 30-60 min if you don't utilized efficiencies offered in the game (boring). It is thus essential to take advantage of the AI govonor, or the ability to line up a series of things to be build in every city, or to get a bunch of cities on the same path and treat them as a group. All these features are either not as good or lacking in CIVIII. On the other hand CIVIII's AI is much better as it has a much simpler game to manage and CIVIII games seldom get as boring as CTP games can. In CTP the AI does not emphesise tile imporvements enough and often fails to construct efficient formations. In CTP you are likely to command more units, more cities, have longer turns, and spend more time working adjusting tax rates and such. The way the game advantages larger armies creates a cascading effect in war. When you attack an enemy he brings his armies foward for the big several battles, you then win and stopm all over the rest of his nation because he is unable to garner a large contingent of troops at one spot. This of course adds to the realism but turns excitment in to despair or boredum. To make up for this CTP has a large number of non-combat units; lawyers, spys, cyber-spys, franchises and more. These units can do anything from plant nuclear weapons to free and capture slaves to steal production and wealth; they add a fun demention to the game although i wish that they could occupy the same space as an enemy combat unit as they are supposed to be stealth but are always discovered when they are bumped into, which is dumb on realism, i mean when was the last time a kinght slew a law firm? I digress. In short CTP is more complex and offers a better multiplayer expierence due to longer turns and multiple methods of attack. CTP is a great game for those who are hard-core strategy gamers, at the same time though the AI is not good enough to really challenge the hard-core gamer enough. CTP is great for those aspiring hard-core strategy folks out there, high school aged types. For a very challenging yet one dementional style of play i would chose CIVIII hands down. I enjoyed CTP alot until i discovered how to reliably whop the AI. This game is in the genre created by the Civilization games. It has some great features that arent seen in many of the other "civ" type games such as underwater cities. However the game assumes that you know all about the tech tree and doesnt offer much information automatically about what direction tech is taking you. Although you can set a far off tech goal and the computer will point you in the direction of that tech. 1. WAY TOO MANY BUGS: The game crashes often. Also, there's a problem with save game files being corrupted that gets progressively worse as the game progresses. -- I finally gave up after a game that I had spent 25 hours on would not reload, even though I had EIGHT seperate save game files from the last EIGHT turns. Every single one of them was corrupted. There are also numerous less catastrophic, but more consistent flaws in the programming. For example, stealth units are supposed to be clandestined. When you are attacked by one, you don't know who sent it. The computer players, however, always do, and immediately declare war in response to any stealth attack by you. 2. BADLY WRITTEN DOCUMENTATION: Quite frankly, this is the worst rulebook I have ever seen. It's long winded and repetitive, yet still lacks many key pieces of information. As a result, you have to use trial and error to figure out how much of the game works. One example: the rules mention that you must have military units on hand to control your slaves, but never spells out how many. The right ratio turns out to be 1:3, but you wouldn't know that unless your read the rules to Call to Power #1. 3. WHOLE PARTS OF THE GAME DESIGN JUST DON'T WORK: While the stealth units are interesting, some of them are so badly designed that they just don't work. The Cleric, for example, is the chief weapon of the Theocracy, which uses it to go out and convert enemy cities to your faith. This is an expensive and risky operation. However, it is so ridiculously easy to undo this conversion (station a military unit in the city, endure one turn of mildly elevated unhapiness among the citizens) that no player (computer or human) ever allows a city to remain converted for more than one turn. So why bother having the cleric unit in the game in the first place? There are similar extreme problems with other parts of the game, many of them left over from Call to Power 1. Do these people ever playtest their own products? 4. CLUNKY INTERFACE: The interface is badly designed. Information that could easily be put on one screen gets spread out over two or three. For example, information on trade routes that you currently have and those that are still available are placed on different screens. So to compare them and figure out if you have the optimal set of routes requires endlessly flipping back and forth between two screens. Overall, I just don't see how the designers could have played this game and still released it in the pathetic state that they did. This is the second game that I've bought from Activision which was released in an unplayable condition. Personally, I'm swearing off their products in the future. If you have not played Sid Meier's original Civilization or Civilization II (without the Call to Power in the title) then you do not know how good this game use to be. Civilization III is probably a few months away. Sid Meier actually has input in Civilization III which means it will most likely be a decent game. Firaxis is producing CIV III and Hasbro is publishing it. If you feel the need to play Civilization, go find an old copy of Civilization II before it became Call to Power. Activision took away too many cool features. I bought this game and the most upsetting part of the game is that you cannot go past a number of cities without changing a form of government that does not exist yet. CTP 2 is very difficult to compare to the first Call to Power (which is itself quite different from the original Civilization series). Many new features have been added, and a few taken out, which in the end makes it feel more "real". Suggestions from users were the basis for most of the revisions, making this almost a game "for players, by players". One of the most powerful additions is an apparent revamping of the senario system. Now, the senarios are not just limited extentions of the main game: they are almost games in themselves. Although only two (save the World Map, which is just a game on the good ol' planet Earth) are included the potential for development is huge. This of course means that individual users will have a bit of a time actually creating their own senarios, which would involve lots of programming no doubt, but I believe this to be one feature Activision will be sure to push. Overall, however, the game feels terribly rushed. Every other version of the game, from the first Civ on, has been carefully constructed with practically few bugs or faults present in the initial release. CTP 2, however, has a number of little glitches which, although they do not hamper gameplay or crash the program, are a bit annoying. Also, the interface seems to be geared exclusively with people who played the orignial CTP in mind and does not seem to have the beginer in mind. With most of the computer users in the US devotees of the Civ series, however, this shouldn't be too much of a problem. I'm not a big fan of turn based games, but I liked this one. It's kind of like an Age of Empires meets Sim City, I thought.